The Beehive Grass Thatched House was a highly distinctive structure used as a shelter or house style that was built by tribes of the Southeast cultural group who made them their homes. These unusually tall grass thatched houses were unusually tall and highly durable, lasting for up to 15 years. Their intricate framework was thatched with switchgrass. Learn about the structure and the interior of the Beehive House with pictures and images together with facts and information about the tribes who used them, including the Caddo, Witchita and the Yucci people. Definition: The Beehive House was a circular construction built over a circular framework of long poles that were covered in narrow, horizontal layers of thatched grass bundles (switchgrass) that were sewn or fastened into place with a leather fastening cord using a long wooden thatching needle. The bottom edge of each horizontal thatched layer was carefully evened with the use of a paddle and as the structure grew it gained its distinctive 'beehive' appearance. The dwellings were very tall and measured about 30 ft (9 m) in diameter. Who lived in a Beehive House? 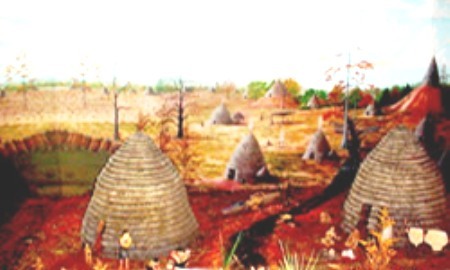 The Beehive House was commonly used as a shelter and home by some of the Southeast Native Indian Tribes who inhabited areas with river valleys, prairies and swamps in the present-day states of Louisiana, Texas and Arkansas. The names of the tribes who lived in the Beehive style houses included the Caddo, Yucci and Wichita people. Why was the Beehive Grass Thatched Hut chosen as a house style? Every tribe choose a type of housing to suit their lifestyle, the climate, the environment and the natural resources (known as biomes) that were available to them, and the tribes of the Southeast region were no different. The poles required for the framework of the Beehive House were selected from the trees that grew in the area such as pine, elm and cedar. The thatch was made with switchgrass (Panicum virgatum). Switchgrass (Panicum virgatum), also known as tall prairiegrass or simply thatchgrass, is found in the southern states where the tribes lived. This hardy and versatile grass grows up to nearly 9 feet (2.7 m) tall with grass-like leaves and reddish flowers. Switchgrass is tolerant of poor soil, drought, and flood conditions. The stem, or stalk, of the switchgrass is the part of the plant used in making the thatch for the beehive houses. The people who lived in a beehive house village were farmers and their villages were surrounded by the crops in their fields. The types of crops grown by the tribes included corn, beans, squash and pumpkin. The villages consisted of the tall thatched beehive houses and often featured a ceremonial lodge. The ceremonial lodge was taller than the houses, and had a 60 ft (18 m) diameter. It also featured an entrance tunnel. The beehive house was very tall and consisted of a large single room with second and third story levels and was big enough to house a family. Beds, consisting of dried grasses covered with animal hides, were located on the lower level. A hearth was built in the center of the dwelling for heating and cooking. The upper levels of the beehive house were used for storage. How was a Beehive Grass House built?